American Allied Safety Council, AASC, is TekSolv’s partnership with The Council of Owners and Construction Associates, Inc. and Midwest Occupational Medicine. This training council provides the best in occupational health, training, and safety services. We can also provide additional training on site or online. We offer site-specific services to provide you and your team with the most benefit. 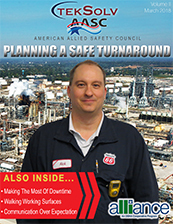 The U.S. Department of Labor's Occupational Safety and Health Administration (OSHA) and TekSolv's American Allied Safety Council (AASC) formed an alliance to provide skilled trades and others with information, guidance, and access to training resources that will reduce and prevent exposures - such as electrical, fall, struck-by, caught-in-between, fire, explosion, lockout/tagout, and confined spaces. 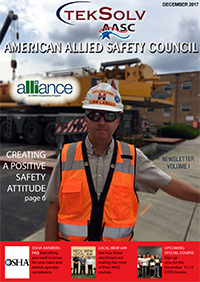 In addition to providing training and education, the alliance also intends to; help workers understand their rights and employers understand their responsibilities under the Occupational Safety and Health Act, provide outreach and communication and raise awareness of rulemaking and enforcement initiatives. We offer Compliant, Quality and Consistent Training resulting in a safer regional workforce. Our contractor onboarding process is streamlined to result in “Badge Ready” and “Tool Ready” workers upon arrival to the job. We know what it means to run a transparent and safety business. 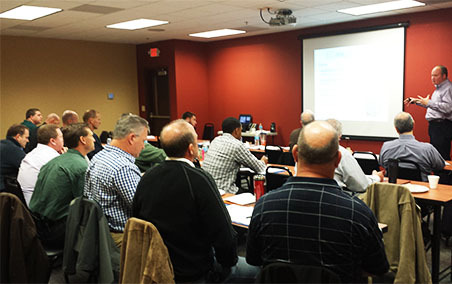 Our cost-effective training for contractors will translate into cost savings for owners. We can meet all of your recordkeeping requirements for contractors, and we are fully auditable and accessible by stakeholders. Check out our other training pages for more information on our class offerings. We offer Safety and Environmental Training and Rescue Training.